← 52 Weeks of Colour Challenge: Jade! Mamaa Saiz: I don’t mind sharing at all. I started playing for money at 15 years old – not a LOT of money, but money. I was in a couple of bands, one of which was actually fairly successful. We had as our manager, the lady who produced the local teen dance show so we not only got great jobs playing, we got to go on TV and dance to new records every week. Then I went into the service, the draft was looming. When I came back I immediately started playing again. After a short time, that brought me to Dallas. In Dallas, while recording a demo, I met Wilson (of Bowley and Wilson), and wound up playing with them for 14 years. When that played out, I took a break to raise my children, although I still played at parties and when friends came over. A friend and I put together an oldies act (just the two of us) called Vintage. We did open mics and parties, but not much else. After that was finished I really didn’t perform again until I started playing in here last January. Gillian Galicia: I’m sure there are lots of stories from the road, but I’m going to move to the SL part of your career. Can you tell me a bit about your current style, what you play, why that music speaks to you, and some of your musical influences? 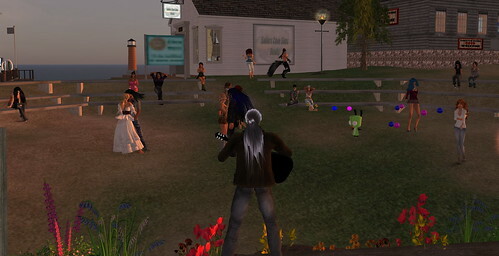 Mamaa Saiz: When I started playing in SL, I really DID sit down and make a list of songs that I would love to perform. I started practicing, and had to throw out about half of them… too hard, too high, too fast, too slow. Basically those songs didn’t work for my format. My style is very much like sitting in my living room with a friend, and just sharing a song. You have noticed that most of my songs are sad songs. That is because I find that emotional reservoir the easiest for me to tap. I can picture a scene (real or imagined), and emote the feelings that it gives rise to. As far as my style goes, I have always tried to find a way to get just a little more out of the performance, an extra musical line (in addition to the vocal and basic guitar structure), maybe the illusion of a harmony voice (by echoing the imagined part of guitar). I guess my heaviest influences were Latin music based. Carlos Jobim hypnotized me when he played. He did things that felt like magic when they came out of the guitar. I have always loved the big band stuff too, so I grew up hearing layered parts (winds, brass, percussion) and I try to add a touch of that whenever I can. Gillian Galicia: I know you’ve recently incorporated original songs into your set list, and I’m not just blowing smoke when I say that I just love them. You mentioned you play sad songs and that they work because of your empathy and ability to put yourself into them. I think your originals are that x 100! Can you talk a bit about your own songs and how you feel sharing them with people here in SL? For the rest of the interview, please click on this link right here–>Musical Interlude: An Interview with Mamaa Saiz. There are more photos, more of Mamaa, and fashion details, too! This entry was posted in Fashion, Live Music in Second Life, MV-SL-Fashion, Second Life Fashion and tagged Mamaa Saiz, music, SL Live Music, SL musician. Bookmark the permalink.